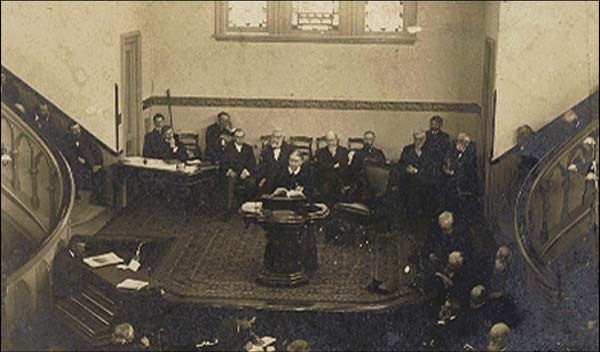 The 1888 General Conference Session held in Minneapolis was a turning point for the Seventh-day Adventist Church. From that time to our day it has been a subject of much discussion and controversy. Some regard this experience as a repetition of history, comparing it with ancient Israel’s coming to the borders of Canaan, Kadesh-barnea, and because of unbelief having to turn back into the wilderness. Others, such as L. E. Froom in his book, Movement of Destiny, attempt to interpret the events of this conference as a victory and a turning point for good in the church. In this lesson we shall trace the events that led to this conference and see what happened there. 1881. “Unconsecrated ministers, professors, and teachers assist Satan to plant his banner in our very strongholds. . . .
“The anger of the Lord is kindled for those things.” – Testimonies, vol. 5, p. 12. 1882. “I am filled with sadness when I think of our condition as a people. . . .
“The church has turned back from following Christ her Leader and is steadily retreating toward Egypt.” – Testimonies, vol. 5, p. 217. 1882. “I have been shown that the spirit of the world is fast leavening the church. You are following the same path as did ancient Israel. There is the same falling away from your holy calling as God’s peculiar people. You are having fellowship with the unfruitful works of darkness. Your concord with unbelievers has provoked the Lord’s displeasure. You know not the things that belong to your peace, and they are fast being hid from your eyes. Your neglect to follow the light will place you in a more unfavorable position than the Jews upon whom Christ pronounced a woe. “I have been shown that unbelief in the testimonies has been steadily increasing as the people backslide from God. It is all through our ranks, all over the field. But few know what our churches are to experience. I saw that at present we are under divine forbearance, but no one can say how long this will continue. No one knows how great the mercy that has been exercised toward us. But few are heartily devoted to God. There are only a few who, like the stars in a tempestuous night, shine here and there among the clouds.” – Testimonies, vol. 5, pp. 75, 76. 1887. “What is our condition in this fearful and solemn time? Alas, what pride is prevailing in the church, what hypocrisy, what deception, what love of dress, frivolity and amusement, what desire for supremacy! All these sins have clouded the mind, so that eternal things have not been discerned.” – Review and Herald, March 22, 1887. 1888. “The facts concerning the real condition of the professed people of God speak more loudly than their profession, and make it evident that some power has cut the cable that anchored them to the Eternal Rock, and that they are drifting away to sea, without chart or compass.” – Review and Herald, July 24, 1888. Seeing the condition of the church at that time, the Lord had a message for the people. But who was to give this message when the leadership was no longer faithful to the Master? “Unless those who can help in — are aroused to a sense of their duty, they will not recognize the work of God when the loud cry of the third angel shall be heard. When light goes forth to lighten the earth, instead of coming up to the help of the Lord, they will want to bind about His work to meet their narrow ideas. Let me tell you that the Lord will work in this last work in a manner very much out of the common order of things, and in a way that will be contrary to any human planning. There will be those among us who will always want to control the work of God, to dictate even what movements shall be made when the work goes forward under the direction of the angel who joins the third angel in the message to be given to the world. God will use ways and means by which it will be seen that He is taking the reins in His own hands. The workers will be surprised by the simple means that He will use to bring about and perfect His work of righteousness. “The Lord works where we least expect Him; He surprises us by revealing His power through instruments of His own choice, while He passes by the men to whom we have looked as those through whom light should come. . . .
“Even if all our leading men should refuse light and truth, that door will still remain open. The Lord will raise up men who will give the people the message for this time.” – Testimonies to Ministers, pp. 106, 107. “God will work a work in our day that but few anticipate. He will raise up and exalt among us those who are taught rather by unction of His Spirit than by the outward training of scientific institutions.” – Testimonies, vol. 5, p. 82. “The time of test is just upon us, for the loud cry of the third angel has already begun in the revelation of the righteousness of Christ, the sin-pardoning Redeemer. This is the beginning of the light of the angel whose glory shall fill the whole earth.” – Review and Herald, November 22, 1892 (quoted in CHRIST OUR RIGHTEOUSNESS, by A. G. Daniells, p. 56). Thus we conclude that the angel of Revelation 18 began his work at the conference in 1888. Let us see how this angel was received. “I can never forget the experience which we had in Minneapolis, or the things which were then revealed to me in regard to the spirit that controlled men, the words spoken, the actions done in obedience to the powers of evil. . . . They were moved at the meeting by another spirit, and they knew not that God had sent these young men to bear a special message to them which they treated with ridicule and contempt, not realizing that the heavenly intelligences were looking upon them. I know that at that time the Spirit of God was insulted, and now when I see anything approaching to the same course of action, I am exceedingly pained.” – Letter, S-24-1892. “Those who have rejected the messages God has sent, will hear most startling declarations. The Holy Spirit will invest the announcement with a sanctity and solemnity which will appear terrible in the ears of those who have heard the pleadings of infinite love, and have not responded to the offers of pardon and forgiveness. Injured and insulted Deity will speak, proclaiming the sins that have been hidden.” – Special Testimony, Series A, No. 7, p. 54, 1896. “They began this satanic work at Minneapolis. Afterward, when they saw and felt the demonstration of the Holy Spirit testifying that the message was of God, they hated it the more, because it was a testimony against them. They would not humble their hearts to repent, to give God the glory, and vindicate the right. They went on in their own spirit, filled with envy, jealousy, and evil surmisings, as did the Jews. They opened their hearts to the enemy of God and man. Yet these men have been holding positions of trust, and have been molding the work after their own similitude, as far as they possibly could. . . .” – Testimonies to Ministers, p. 80. Some held hopes that at a later session of the General Conference a revival and reformation would take place, but to their disappointment the years passed by and no change was seen in the course of the church and her leaders. “Today there are few who are heartily serving God. The most of those who compose our congregations are spiritually dead in trespasses and sins. . . . The sweetest melodies that come from God through human lips – justification by faith, and the righteousness of Christ – do not bring forth from them a response of love and gratitude. . . . They steel their hearts against Him (the Heavenly Merchantman). . . . If they continue in this state God will reject them with abhorrence.” – Review and Herald, April 4, 1893. 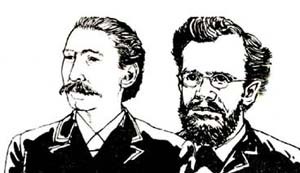 The message presented by the third angel was not able to bring about that revival and reformation called for in the Adventist ranks. This work was left for that other angel who would come down and join with the third angel to give the loud cry (Early Writings, p. 277). “Men of clear understanding are needed now. God calls upon those who are willing to be controlled by the Holy Spirit to lead out in a work of thorough reformation. I see a crisis before us, and the Lord calls for His laborers to come into line. Every soul should now stand in a position of deeper, truer consecration to God than during the years that have passed. . . .
“I have been deeply impressed by scenes that recently passed before me in the night session. There seemed to be a great movement – a work of revival – going forward in many places. Our people were moving into line, responding to God’s call. My brethren, the Lord is speaking to us. Shall we not heed His voice? Shall we not trim our lamps and act like men who look for their Lord to come? The time is one that calls for light bearing, for action.” – Testimonies to Ministers, pp. 514, 515. “The Spirit of God is departing from many among His people. Many have entered into dark, secret paths, and some will never return. They will continue to stumble to their ruin. They have tempted God, they have rejected light.” – Testimonies to Ministers, p. 90 (1895). “The conference at Minneapolis was the golden opportunity for all present to humble the heart before God, and to welcome Jesus as the Great Instructor; but the stand taken by some at that meeting proved their ruin. They have never seen clearly since and they never will; for they persistently cherish the spirit that prevailed there, a wicked, criticizing, denunciatory spirit.” – January 9, 1893, written from Melbourne. “‘And thou, Capernaum [Seventh-day Adventists who have had great light], which art exalted unto heaven [in the point of privilege], shall be brought down to hell: for if the mighty works, which have been done in thee, had been done in Sodom, it would have remained until this day. But I say unto you, that it shall be more tolerable for the land of Sodom in the day of judgment, than for thee.’ Matt. 11:23, 24.” – Review and Herald, Aug. 1, 1893. [Brackets in original.] In our next lesson we shall study what happened following this fateful conference. “The Lord in His great mercy sent a most precious message to His people. . . . This message was to bring more prominently before the world the uplifted Saviour, the sacrifice for the sins of the whole world. It presented justification through faith in the Surety; it invited the people to receive the righteousness of Christ, which is made manifest in obedience to all the commandments of God. Many had lost sight of Jesus. They needed to have their eyes directed to His divine person, His merits, and His changeless love for the human family. All power is given into His hands, that He may dispense rich gifts unto men, imparting the priceless gift of His own righteousness to the helpless human agent. This is the message that God commanded to be given to the world. It is the third angel’s message, which is to be proclaimed with a loud voice, and attended with the outpouring of His Spirit in a large measure.” – Testimonies to Ministers, pp. 91, 92. “Mrs. E. G. White from California was present, also Dr. E. J. Waggoner and Elder Alonzo T. Jones from California were there. It fell to the lot of Jones and Waggoner to conduct each morning the consecration services of the conference. They taught us in the most kind and simple way that Jesus the Lamb of God took upon Himself all our burden of sin and gave His life for us. That He paid the whole debt and set us free. That He took all our sins and in exchange gave us His righteousness. That He took our filthy robes and gave us His white robe, righteousness in its place. What a wonderful exchange!. . .
“When Christ was lifted up as the only hope of the church and all men, they met with unlimited opposition by nearly all of the senior ministers. They tried to stop the messengers from further presentations or discussion of Righteousness by Faith, and when Mrs. E. G. White told them God’s providence had led Elders Jones and Waggoner to cry aloud on the subject, the opposition selected a man to speak their minds in opposition. “Elder J. H. Morrison was their spokesman. It was arranged that Elders Jones and Waggoner should reply. “Elder Morrison’s discourse was clearcut on the two covenants covering the apostle Paul’s allegory of the bond woman and the free — Ishmael and Isaac representing the people of the old covenant and the new covenant. Sarah, the freewoman demanded, ‘Cast out this bondwoman and her son: for the son of this bondwoman shall not be heir with my son, even with Isaac.’ Gen. 21:10. “Elder Morrison claimed that we had always believed in ‘Justification by Faith’ and were children of the free woman. He taught that the subject had been overstressed at the conference and seemed to be fearful that the law might lose the important place that belonged to it. “Mrs. E. G. White says, ‘As a people we have preached the law until we are as dry as the hills of Gilboa that had neither dew nor rain. We must preach CHRIST in the law, and there will be sap and nourishment in the preaching that will be food to the famishing flock of God. We must not trust in our merits at all, but in the merits of JESUS of Nazareth.’ – Christ our Righteousness, p. 64. When Elders Jones and Waggoner came to reply to their opponents, they stood side by side with open Bibles. “Doctor Waggoner began reading Jer. 23:5-7. “Elder Jones read Eph. 2:4-8. “Doctor Waggoner read Gal. 2:16-21. “Elder Jones read Rom. 11:1-33. “Doctor Waggoner read Rom. 1:14-17. “Elder Jones read Rom. 2:12-29. “Doctor Waggoner read Gal. 3 entire. “Elder Jones read Rom. 3 entire. “Doctor Waggoner read Gal. 5:1-6. “Elder Jones read Rom. 9:7-33. “Doctor Waggoner read Gal. 2 entire. “Elder Jones read Rom. 4:1-11. “Doctor Waggoner read Rom. 5 entire. “Elder Jones read Rom. 4:13-25. “Doctor Waggoner read Rom. 6 entire. “Elder Jones read Rom. 1:15-17. “Doctor Waggoner read Rom. 8:14-39. “Elder Jones read 1 John 5:1-4. “This was their answer without a word of comment, they took their seats. “For the entire time of the reading there was hushed stillness over the vast assembly. This made an everlasting impression upon the writer that time can never efface. . . .
“Mrs. E. G. White, who had been seated on the platform, arose to her feet and when recognized said: “Brethren, this is the Lord’s work, does the Lord want His work to wait for Elder Butler. The Lord wants His work to go forward and not wait for any man.’ There was no reply to what she said. “Elders Jones and Waggoner went on with their message. . . .
“From Mrs. E. G. White’s attitude and words, she stood 100% behind Elders Waggoner and Jones in presenting God’s message at the Minneapolis Conference. . . .
1. What significant conference was a turning point for the Seventh-day Adventist Church? 2. Was a change for the better made there? 3. What was the church's spiritual condition just before this conference? 4. With whom did Sister White compare the Adventist Church? 5. What men were used by God to present a special message to this conference? 6. Was this a usual or an unusual channel of communication from God? 7. What was the message that was given? Was it endorsed by the Spirit of Prophecy? 8. What "angel" visited this conference? 9. What work actually began here? 10. Was the challenge accepted? 11. What was predicted because of rejection of the message in 1888 and in the years to follow? 12. Would another opportunity ever come to the church like the one at this conference?